There are various interesting videos on Facebook shared by your friends. Do you want to download Facebook videos to computer for offline playback or preservation? It's annoying that Facebook doesn't provide a direct option to save the videos. Here in this article, we'll show you how to download videos from Facebook with Google Chrome, Firefox or Safari easily. Just follow the instructions. To download a Facebook video, you need a movie downloader. 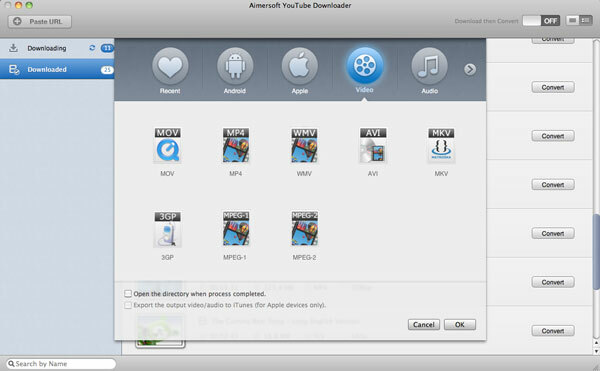 Aimersoft video downloader for Mac here is highly recommended as the best Facebook video downloader to capture Facebook videos within your browsers. Moreover, the built-in video converter allows you to convert Facebook videos to popular video formats like MP4, AVI, WMV, MOV, etc. for playing on iPhone, iPad, iPod, Apple TV, PSP, HTC, Samsung and more. 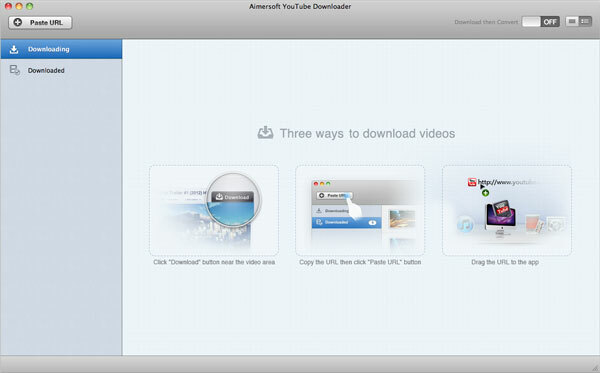 To save videos from Facebook in Windows (Windows 8), get the Aimersoft YouTube Downloader and you can finish your task in clicks. Now download the program and check out the easy steps to grab videos from Facebook to computer. Note that here the screenshots of video downloader Mac version (compatible with Mountain Lion) are used to show you how easily and quickly it is to save online Facebook videos to your computer's hard drive. The way to download Facebook video clips in Windows is the same. Please just make sure you've got the right version according to your situation. First, follow the wizard to install the smart app on your computer. Then launch it and you'll see its interface as below and you have 3 ways to capture videos from Facebook: 1> Click the video the appears on the top right of the video. 2> Copy and paste video URL address to add it to the downloading list. 3> Drag the video URL to the program to start downloading it. Tips: Apart from downloading video files from Facebook, this video grabber can also fetch videos from other popular video sharing sites like YouTube, Vimeo, Metacafe, Dailymotion, Hulu, VEVO, Megavideo, BBC, NBC, BlipTV and more. Now surf to find the video you want to download in your Web browsers (Chrome, Firefox and Safari are all supported). Play the video and choose either way to get the video to your computer. Once the downloading process completes, you can find all the downloaded Facebook videos under Downloader tab. In this way, you've successfully downloaded Facebook videos with your web browser. To make your digital world more fun, this downloader comes with more: 1> You can play the downloaded Facebook videos with the built-in FLV player (full-screen playback is supported) and manage your local FLV/MP4 videos. 2> You can even convert the saved Facebook videos to any regular video/audio formats you like, including MP4, AVI, WMV, MOV, MP3, etc. so you can play Facebook videos virtually anywhere you like.